Are heritage nectarines worth the bother? Have you grown any nectarines that look like this? This is the Goldmine nectarine, and sadly, they tend to do this when they get a drop of rain, if the weather conditions don’t suit them perfectly, or when you look at them the wrong way! Heritage varieties often have thin skin, and Goldmine are a particular culprit. This means they tend to mark very easily. It’s one of the reasons that many heritage varieties are no longer grown commercially, because they’re just not robust enough to get to market in good condition. Despite this, we’ve grown them in our orchards and sold them for many years, because they’re absolutely delicious, and worth the effort! If the marks are severe enough they can also become the site for an infection to begin, but usually these are just skin marks, caused by rain, that don’t effect the quality of the fruit underneath. But they’re also prone to other problems — for example if you get a severe case of Leaf curl on your nectarine trees, Goldmine can show damage on the skin of the fruit, even though this disease mainly affects the leaves. But despite all the difficulties, we love them and frequently recommend them for home orchards. If you can tend the tree carefully, protect the fruit and then pick it when it’s beautifully ripe and ready to eat, you can end up with a result as perfect as these beauties! It’s quite hard to find Goldmine trees these days (and almost impossible to buy the fruit) because they’re very unfashionable, but if you have space for a tree in your garden and can track one down, and you have time to look after it properly, it will reward you. Author KatiePosted on March 1, 2019 March 1, 2019 Categories Disease control, Grow Great Fruit, grow your own food, Home grown food, nectarine, Permaculture, picking fruit, Weather and fruit growing, what do normal fruit trees look likeTags #growgreatfruit #organic #growyourown #homegrown #treehealthLeave a comment on Are heritage nectarines worth the bother? Noticed any brown rot this summer? One of the diseases it’s important to monitor at this time of the year is Brown rot. 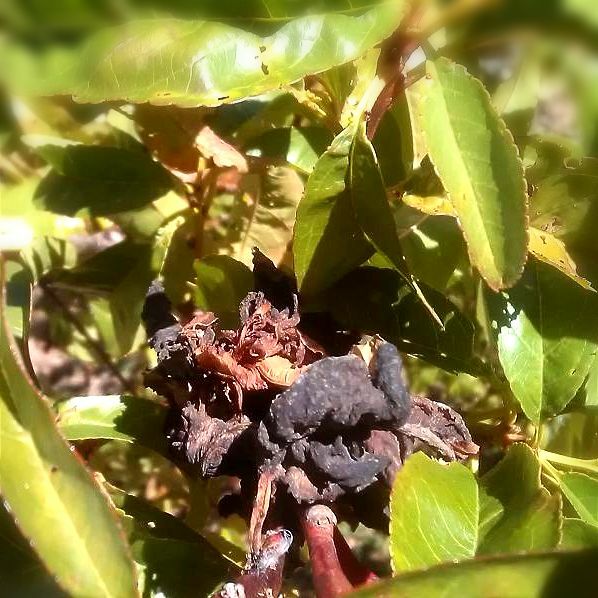 In our part of the world (in southern Australia), our typically hot, dry conditions have not favoured the disease much this year, but we’ve still noticed an occasional piece of fruit with it, as you can see. If you’ve had a rainy fruit season, you’re at a much higher risk of a Brown rot outbreak. It particularly loves warm, wet weather. It’s important to pick any fruit that show symptoms, and dispose of it well away from the tree – put in the compost, feed to animals, or cook (after you cut off the bad bits, of course!). The infection can quickly spread (especially in rainy weather), so monitoring your trees once a week, and removing infected fruit, gives the remaining fruit the best chance of staying healthy. Even in organic gardens and farms, it’s possible to take preventive action to minimise the risk of diseases like Brown rot. Hygiene (e.g. removing fruit as described above) is one of the most important, but you should also aim to keep a ‘cover’ spray of one of the safe organic fungicides on your trees at all times. If you only have a few trees to manage, you can quickly and simply do this job with a simple sprayer, as Hugh is demonstrating here. With more trees to manage, you may want a more mechanised set-up. There are so many spray systems to suit every size of garden or farm, but it can be really hard to figure out which spray system will suit you best, and what’s the best balance between budget and value. It’s not worth spending hundreds (or thousands) of dollars on a system that’s too big and sophisticated for your needs. On the other hand, you may be able to save yourself many, many hours (and therefore $$) by investing in a system that will do the job you need quickly and efficiently. It depends on a few things — how many trees you have, your topography (i.e. how steep your block is), what equipment you have available, and your goals for your fruit trees. If you’re hoping to sell some of your fruit, for example, you really need to make sure you can spray quickly, and easily, as often as you need to. We’ve demystified the whole topic in our short online course Choose the Right Spray Gear. Author KatiePosted on February 21, 2019 February 21, 2019 Categories Disease control, Grow Great Fruit, grow your own food, nectarine, Organic growing, Permaculture, plumTags #growgreatfruit #organic #growyourown #homegrown #treehealth2 Comments on Noticed any brown rot this summer? We want to talk about Leaf curl. It’s a common fungal disease of peach and nectarine trees (if you have leaves curling in other types of trees it’s caused by something else). It may seem strange to be talking about it so late in summer, as it’s a disease that shows up in spring, but bear with us! If you noticed the disease in your trees last spring, the trees should have completely recovered by now, and grown lots of healthy new leaves (that should look something like the photo below). However if you’re not sure whether your trees had the disease, it may still be possible to find out, as you may still have remnant diseased leaves in your trees. In fact, this can be one of the dignostic tools you can use to help identify whether you had this disease in your trees, in the ongoing detective work we need to be doing to become awesome fruit growers! These dead and shrivelled leaves are a powerhouse of fungal spores sitting in the tree, just waiting until conditions are perfect next spring to release the spores, and start the disease cycle all over again. It’s been often and hotly debated whether it’s worth removing infected leaves from the tree as they emerge in spring, and the answer seems to be no, it doesn’t help reduce the spread of infection once it’s started. However, the jury is still out on whether removing the remnant leaves in summer will help prevent re-infection the following spring. As always, we err on the side of caution when it comes to practical, hands-on jobs you can do to help your trees stay healthy. So…get rid of them! Many of these leaves will probably have fallen off of their own accord and rotted away under the tree, but if there are any still in your trees, remove and dispose of them. Hot compost is the perfect disposal method, as the high temps reached will kill off the fungal spores, but the organic matter in the leaves won’t go to waste. Remember, prevention is much better than cure, and hygiene is one of the best defenses we have against all pests and diseases. Another strong defence is using allowable organic sprays in spring, but it only works if you get the timing right. We’ve included a complete spray program to help you decide what and when to spray in the short course Better Fruit with Wise Organic Spraying.